Essential oils are mixtures consisting of monoterpene and sesquiterpene monocarbons, their oxygenated derivatives, and aliphatic oxygenated compounds. The difficulties that arise in the GC-MS peak identification of these complex samples is due to the fact that many terpenes have identical mass spectra. This is a consequence of similarities both in the initial molecule and in their fragmentations and rearrangements after ionization. Hence, MS identification of these compounds should always be accompanied by retention time information that may support MS library search results. 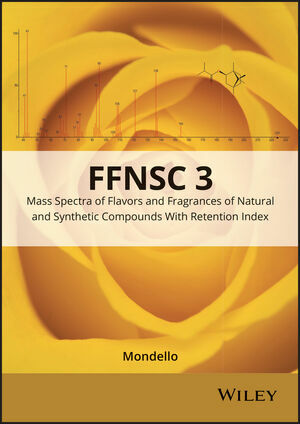 This innovative MS library for natural and synthetic products (essential oils, perfumes, etc.) makes the identification of unknown compounds in complex mixtures easier, faster, and more reliable. Chromatographic information, such as Linear Retention Index (LRI) data, can be used to filter MS results, enabling more reliable peak assignment of components in complex mixtures. Mass spectra, relative to standard and well-known simple matrix components, were obtained and recorded through GC-MS separation/identification. Furthermore, traditional information relative to each component (CAS number, common name, CAS name, molecular weight, compound formula, chemical class), plus linear retention index values, are entered.